this is a bit of a large download, at 1.3 gb, and will take a while, but it’s at 24 bits – 48 khz. i was going to downsample it, but (obviously) decided not to. this is a lovely show, but given the equipment that i use, there’s not really a payback in sound quality for the additional file size at 24/48. and it is good, like the other shows from sunside that i’ve downloaded. if i make it to paris instead of madrid, sunside is on my to-do list. for now, it’s a stroll over to clamores jazz or bogui jazz whenever i’m down from dublin (as just this moment); a change of pace from my usual haunts. it’s a bit of a busy time around here, so posts will be a bit irregular for the next while until we finish our move. why not a bit of fred hersch to help me focus? enjoy. 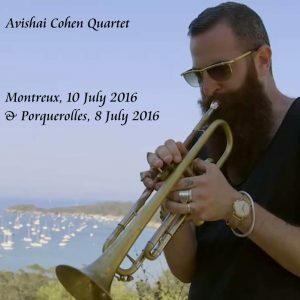 avishai cohen (trumpet, not bass) is someone who only came to my attention last summer, which seems already so far away as we have the first snow of the season. he’s phenomenal, how can i have missed this guy for so long? time to start listening to more radio again, maybe wpfw-fm online (an old favorite from my days in washington dc). the shows that i have are all mp2 or video, so that’s what here. first, we have an hour & a quarter in montreux last summer, and then a bonus since mp2 takes so little space: a short video from porquerolles just two days before that (i’ve also demuxed the audio for you, but haven’t the patience this week for tracking it). the disk cover uses a screenshot from the porquerolles video. btw, most of avishai cohen’s cds are available on anzic records through bandcamp.